If the long lines and prices don't deter you, you will enjoy the fun waterfront ambience of this popular tourist eatery. 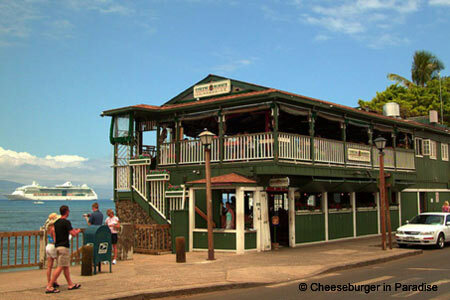 : Located in the heart of Lahaina Town on bustling Front Street, Cheeseburger in Paradise is a two-story verandah-type café that hangs over the water. It's a lively, airy and casual place for breakfast, lunch or dinner, provided you have the time to wait in its infamously long lines. The menu is terse---burgers are the crux of what's offered here, along with a surprising selection of vegetarian burgers, chicken Caesar, chili fries, onion rings and the requisite nutty cocktails. But it’s the waterfront views that make the wait worthwhile, despite the prices. Live music from 4:30 p.m. until closing nightly.